Google just let attendees to today's hardware-filled I/O conference love up on the new Nexus 7 tablet. It's light, it's compact, and holy crap, it's faster than hell. 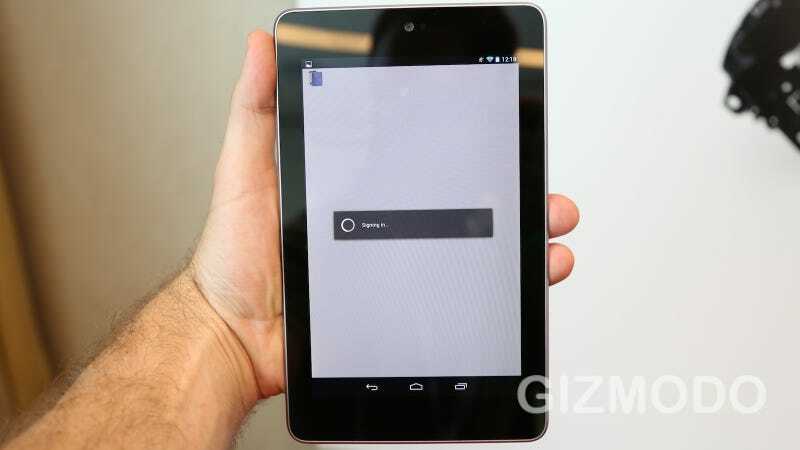 In short, you won't believe this is a $200 tablet. First thing you notice is that it's incredibly solid. There are hard aluminum edges, and a rubberized back that feels soft and grippy. It easily fits in a jacket pocket, and even (just barely) in a jeans pocket (though that's not recommended). It has a front-facing camera, but no rear camera, which is good because you shouldn't be taking photos with your freaking tablet anyway. Volume up/down rocker, power button, micro USB and a headphone jack. Sadly, there's no expandable storage, but Google is emphasizing its cloud portfolio, so that makes sense. The boot time is very quick. The screen is bright and vivid at first glance. Then you start scrolling around the operating system and it's perfectly smooth. Google used the word "butter," and so far, that looks pretty apt. Jellybean is rather lovely, and it really utilizes the tablet-sized screen much better. For example, there are six shortcuts (plus the app drawer), in the home row. Plenty more time with the Nexus 7 is needed before a full review, but snap judgement: There is zero reason to buy a Kindle Fire over this. It's brighter, sharper, faster, and infinitely more capable. Your move, Amazon.